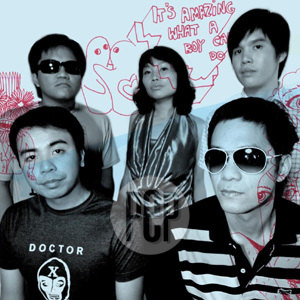 "CambioMatic" album features carrier single "Call Center"
(From left, clockwise) Buddy Zabala, Ebe Dancel, Kris Gorra-Dancel, Diego Mapa, and Raimund Marasigan comprise the band Cambio, which has just released its album titled CambioMatic. The five-member band Cambio has just signed with MCA Music Philippines and their sophomore album CambioMatic was released last July 2. This 12-track album features the carrier single "Call Center," a catchy and timely track which is currently firing up radio’s hotlines since its May 28 premiere on NU 107. The music video of "Call Center" was first seen on MYX last Sunday, July 8. CambioMatic promises to be a curious set of original songs that stand out from the usual crop of pop-rock that’s out in the market. The songs included in the album are: "Admit One Thing," "Shopaholica," "Totoy Boogie," "Rumarampa," "Call Center," "Field Trip," "You Wear Me," "Pasaway," "Bulimic," "Sakanasabi," "Shake Your Pants," and "Passengers." This album contains the band’s assessment of everyday life put into songs that are smart, funny, frank and funky. Inventive yet accessible, catchy without being cliché, it’s music that can make you think and rock on at the same time. All part and parcel of the charm of Cambio. ORIGIN OF CAMBIO. Back in 2003, former bandmates Raimund Marasigan and Buddy Zabala of Eraserheads fame suddenly found themselves with one less band to play in, and a lot of extra time on their hands. It was clear to both though, that they still had a lot of music in them, and that they still wanted to be in a band together. The two saw this as a great opportunity to work with a whole new batch of musicians they’ve admired but never gotten around to playing with. With the rhythm section in place, they both sat down to decide on a vocalist and guitar player. Or two. Or three. Enter Kris Gorra-Dancel, Diego Mapa, and Ebe Dancel. Raimund and Buddy have known each for a few years and have always enjoyed watching them in their different musical endeavors. Kris once fronted the feisty all-girl pop-punk outfit The Fatal Posporos, Diego Mapa sings and plays guitar for Monsterbot (and lately, Pedicab), while Ebe Dancel is known for his pop-rock band Sugarfree. Each one is an amazing vocalist and performer, they’re all proficient on the guitar, and all are brilliant songwriters. But similarities among the three end there. Kris, Diego and Ebe each possess a singular style and flair that range from the quirky to the soulful, from the sublime to the downright strange. Throw everybody into the mix and what you’ve got is entirely weird and wonderful. What you get is Cambio. Cambio entered the studio right away and released a limited independent EP. They released their debut album Derby Light in July that year, after which things quickly shifted to high gear. Highlights from the album included the hits "DV" and "Patlang," plus fan favorites like "Ledgeboy" and "Lihim." Also notable were the videos created for the group’s two singles. "DV" was nominated at the 2004 MTV Style Awards, while "Patlang" featured a batya-bearing cameo from the APO Hiking Society’s Jim Paredes. Live shows went into full swing as well with notable performances at the MTV Music Summit, Fete dela Musique, SMB Oktoberfest, the NU107 Rock Awards and the first Rockestra. The band is also a regular at more intimate clubs like SaGuijo, ‘70s Bistro, Mayric’s, Gweilo’s and Capone’s where they can be seen regularly.